But I want the styles to be fully dynamic, so that I can modify cell values and add/remove rows and the styles will update themselves accordingly. 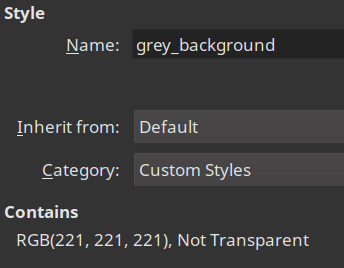 Style grey_background has no properties set except for a grey background. 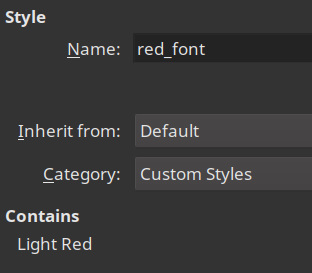 Style red_font has no properties set except for a red font color. 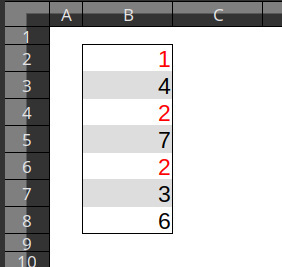 One conditional format applies style grey_background based on the formula isodd(row()). One conditional format applies style red_font if the cell value is less than 5. As you can see, the numbers 4 and 3 didn't turn red, even though they match the "less than 5" condition. It's as if the grey_background style is blocking the red_font style from being applied to the same cell. What is happening there, and how can I fix it? Oh, that's neat. Too bad it only supports these 8 colors though. Yes you are right but IMHO in this context (font color) the number of shades is less important because more difficult to perceive. You need one more format for the row with red background and red font. So to be clear, there's no way to let two styles stack? Manually creating additional styles for each combination isn't very scalable. Imagine if I'd want 10 different dynamic styles... instead of creating 10 Styles and 10 simple Conditional Formats, I'd have to create 1024 Styles and 1024 complex Conditional formats.